It’s not often you sit in a darkened cinema and stare in genuine awe at the artistic beauty of what’s been rendered for your entertainment. 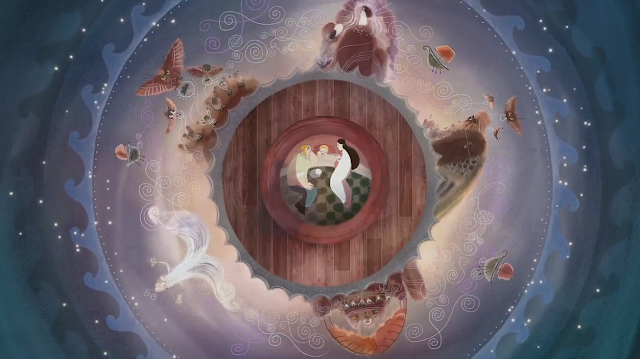 What’s rare is precious and Song of the Sea is like a rare ocean pearl, its swirling beauty drawing you in and enveloping you in its whimsical magic. Its Oscar nomination in February for Best Animated Feature was truly deserved and once again put the work of director Tomm Moore and the team at Kilkenny based Cartoon Saloon onto the world stage (they were also nominated in 2009 for The Secret of Kells). The film’s visual style may take a bow to Studio Ghibli and Hayao Miyazaki but the seeds of it are cultivated by the lyrical beauty of our fair Isle, it’s Celtic artistry and folklore turning it into something truly standalone and seldom seen. Moore’s vision is breath-taking at times but what’s great about Song of the Sea is that it has the story to back it up and entertain the young audience it seeks. Taking inspiration from the mythological Selkies of Irish folklore, who live as seals in the sea but become humans on land, the story centres on Saoirse (Lucy O’Connell) who discovers on her 6th birthday that she is a Selkie. Having lost her mother the day she was born, she lives on a remote island in a lighthouse with her father Conor (voiced by Brendan Gleeson) and her older brother Ben (voiced by Moone Boy’s David Rawle). The stunning animation and excellent voice work draw you in and you can’t help but be moved as the film doesn’t shy away from loss and grief. Gleeson in particular delivers a haunted vocal performance and the scene of his character sitting alone in a bar on the anniversary of the loss of his wife will break your heart. It’s not afraid to go to darker places in order to discover the light making the emotional impact all the more powerful. It’s also perfectly cast with additional support from the great Fionnula Flanagan, Pat Short, Lisa Hannigan and Jon Kenny. As the two children’s adventure takes them inland and further away from the sea, I did feel the hypnosis fade a little, as the characters are literally wrapped up in the mysticism of the tale but it recovers its enchantment again as the finale takes hold. Watching it with my six year old, she was enthralled by the characters, bewitched by the ancient folklore and the music (composed by Bruno Coulais and Kila) had her singing on the way home. A happy customer indeed! Bring the little ones and be enchanted.